If you want to be a truck driver, you are at right place now. LGV driver training has a process of pre defined steps described below. We have access to a large off road training area for the practice truck driving. Where there will be plenty of opportunity to practice and demonstrate the reversing exercise that will be required on the Driving Test. We train our candidates for high competancy not just to pass the test even to get a job successfully. All Modular 3 Practical exams will be conducted by Bains which will take place at a DVSA Driving Test Centre in Yeading Middlesex. Our DVSA Approved Instructors will ensure that you will gain thorough knowledge of the local area and test routes. Get trained for C category without passing C1. Pass on an automatic vehicle and gain a manual licence subject to the driver having a manual car licence. If you’re interested, in booking a C1 driving course / Van Driving lessons. We are your one stop driver training provider. We won’t be beaten on quality and experience. Bains offers C1 practical tuition which is conducted using our modern Ford Transit Panel Van. Our team of DVSA Approved Instructors will ensure that you will gain the necessary driving experience around the local area and test routes. Category C1 allows the holder to drive a large goods vehicle with a maximum authorised mass (Gross vehicle weight) of upto 7500Kg with a trailer having a maximum authorised mass of upto 750kg. The licence can be obtained at 18 years of age and is the replacement for the HGV/LGV class 3 in the UK. HGV/LGV trucks upto 32 tons fall under this category. To drive a large goods vehicle drivers will have to qualify for C provisional entitlement formally called as Class 2 driving licence. To get trained for Class 2 truck driver there is no need to pass C1. Drivers who have a valid full UK licence can get training for this category. The HGV/LGV category C licence will allow the drivers who passed the category C driving test to drive any rigid vehicle up to 32 tons. Once you successfully pass your Category C test you will automatically obtain category C1 entitlement. 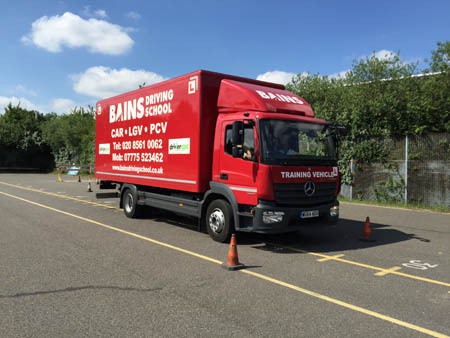 Bains Training Services is a leading LGV driving School and offers category C Driving lessons / Class 2 truck driving lessons. We have excellent off road facilities where we train truck driver learners for manoeuvres and practiced to perfection. In order to receive C entitlement on your licence, you will need to pass an official, practical test. This will take place at our local test centre in Yeading Middlesex. The test will last for approximately 90 minutes. You will be tested on and off the road. From April 2014 it is possible to pass your driving test in an automatic category C+E type vehicle and gain a full manual HGV / LGV licence. As nearly all new trucks are fitted with automatic transmissions it makes sense to change the licence acquisition process to reflect this. At Bains! you can choose, C and C+E training on automatic or manual type lorries. Once you start you C+E training course / Class 1 driver training, you’ll be given essential, practical experience and quality tuition from one of our DVSA Approved Instructors. We’ll tailor your training just for you, taking into account any towing experience you’ve had in the past. We are one of the best truck driving schools in London. We’ll address your concerns, answer any questions you have and help you perfect towing manoeuvres. As part of your course, you’ll be shown how to couple and uncouple correctly and effectively, how to reverse and how to ensure and check your load is both legal and safe for travelling on the UK’s roads. C+E training courses / C+E driving lessons are held at our Hayes Middlesex office, near Heathrow Airport. We have excellent off road facilities where manoeuvres can be carried out and practiced to perfection. In order to receive C+E entitlement on your licence, you will need to pass an official, practical test. This will take place at our local test centre in Yeading Middlesex. The test will last for approximately 90 minutes. You will be tested on and off the road. You will be asked questions by the examiner and be required to demonstrate towing procedures and methods. When you return at the test centre, you will be asked to complete a few more moves such as uncoupling/re-coupling the trailer, just as we've shown you during your training.